The Indian Army is looking for a few good Men and Women. For the best and the brightest amongst you. For men/women with intellect, idealism and courage. 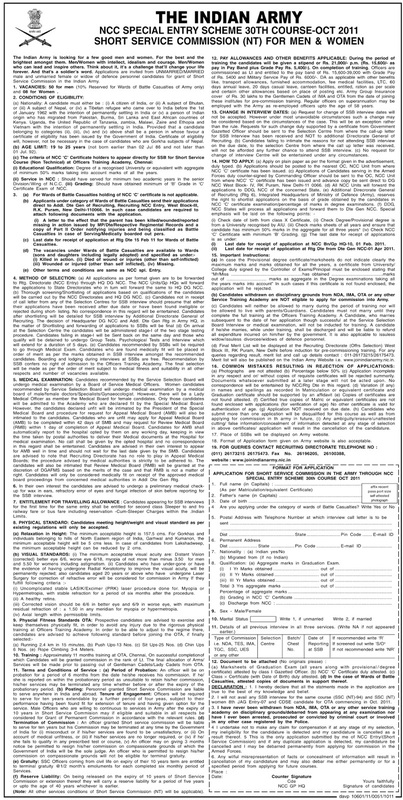 Applications are being invited from unmarried/married male and unmarried female or widow of defence candidates for for grant of Short Service Commission (SSC) in the Indian Army. The Criteria of NCC 'C' Certificate holders to appear directly for SSB for SSC (Non-Technical) at Officers Training Academy, Chennai : (i) Educational Qualification : Degree of a recognized University or equivalent with aggregate of minimum 50% marks taking into account marks of all years. (ii) Service in NCC : Should have served for minimum two academic years in the senior Division of NCC (iii) Grading : Should have minimum of 'B' Grade in 'C' Certificate Exam of NCC. Wards of Battle Casualties : Holding of NCC 'C' Certificate at the time of filling of applications not required. Wards of Battle Casualties send their applications direct to Addl. Dte. Gen of Recruiting, Recruiting NCC Entry, West Block-III, R.K. Puram, New Delhi-110066. A letter to the effect that the parent has been killed/ wounded/ reported missing in action issued by MP/Dte/ Respective Regimental Records and a copy of Part II Order notifying injuries and being classified as Battle Casualties in case of Service/Medically boarded out pers. Last date for receipt of application at Rtg Dte 15/02/2011 for this category. Pay Scale & Stipend : Stipend during the period of training is Rs.21000/-. On completion they will be commissioned as Lt in the pay scale of Rs.15600-39100 wth Grade Pay 5400 and MSP Rs.6000/- and other allowances. Method of Selection : All Applications in the prescribed format will be forwarded to Rtg. Directorate (NCC) through HQ DG NCC. The NCC Units/GP HQs will forward the applications to State Directorates who in turn will forward the same to Hq DG NCC. On arrival at the SSB, the Shortlisted candidates will be administered stage-1 of the two stage testing procedure. More detail are available at http://www.joinindianarmy.nic.in. Click on the image on the above image to view/download all the details and application format.